The skies have gone from overcast to blue, the air is soft and warm and my kid is home from college, it must be summer here in Blog Appetit-ville (Oakland CA). 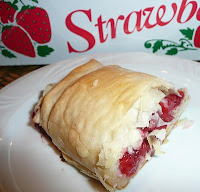 So here is a wrap up of some of the recipes and posts from Blog Appetit that help celebrate the summer here or anywhere. Get Your Red Hots! -- What's summer without hot dogs (or sausages) with all the trimmings. So grab your weiner (except you Rep. Andrew) and try some one or all of these toppings: Vegetarian Chili, Tomato Onions and Homemade Relish. 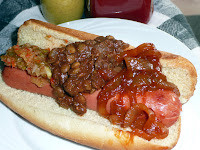 Use a tofu dog and the vegetarian chili and you have a vegan treat. From The Grill -- Everyone needs a good barbecue chicken recipe, here's mine. No extra charge for the recipe using the leftovers in a hearty bbq chicken and greens salad. Or try these chicken kabobs with pomengranate molasses barbecue sauce (the best thing I've ever smeared on chicken.). Here's my son's red wine marinade for flank steak (a family favorite). Try these grilled vegetable kabobs with miso marinade as a main course or side dish. Grilled limincello tuna is served atop a couscous salad. It's Still Strawberry Season -- Try my roasted strawberry strudel, cold strawberry soup or (vegan) strawberry coconut ice cream. All are berry, berry good. Or try my berry sorbet with or without the "berried treasure" and sauce. Pack leftover sorbet into ice pop molds for the best popsicles or fruit paletas you've ever had. The Soup that Went into the Cold -- Soup is good for you but not so hot when it's hot. So try a cold soup. Here's recipes for my beet borscht which is delicious served cold, and my raw, cold mint soup which requires no cooking at all but a bit of the wait for the garlic infused stock to come together. Make Mine a Cold One -- Try making your own ginger ale or sip an egg cream (did you know there is no egg and no cream in an egg cream) to help combat your own personal heat wave. Or try this simple strawberry licuado-style shake. Or maybe a frozen sweet tea. Other Summer Food Ideas -- My Cold Peanut Noodle Salad works well as an appetizer or main course. My husband and I serve Vietnamese Spring Rolls (aka Salad Rolls or Summer Rolls) with a variety of filling options at parties, where he custom rolls each diner's selection of goodies in rice paper or lettuce. Looking for something more formal? This sliced zucchini appetizer from Chocolate and Zucchini makes a nice summer starter. A friend's mother introduced me to this grilled salad, which is easy and delicious. Do you have a summer recipe on your blog/website you'd like to share? Please leave a link in the comments section. Karen, would love your recipe sometime!